(From Sigma lens literature) The Sigma Corporation is pleased to announce the release of the SIGMA 18-200mm F3.5-6.3 II DC OS HSM. This 11.1x high zoom ratio lens is designed exclusively for digital SLR cameras, incorporates Sigma’s original OS (Optical Stabilizer) function and offers a broad shooting range from wide angle to telephoto. 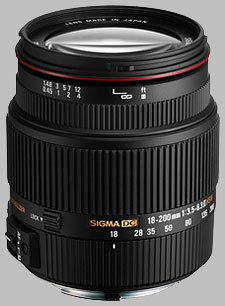 The SIGMA 18-200mm F3.5-6.3 II DC OS HSM is the successor to the SIGMA 18-200mm F3.5-6.3 DC OS HSM which was launched in June 2007. The lens is ideal for travel photography with a compact construction and length of just 87.7mm. This lens features FLD (“F” Low Dispersion) glass elements, which have the performance equal to fluorite glass, and SLD (Special Low Dispersion) glass elements providing excellent correction of color aberration. Aspherical lenses give excellent correction for all types of aberration and distortion. The Super Multi-Layer Coating reduces flare and ghosting, ensuring high quality images throughout the entire zoom range. Sigma’s OS (Optical Stabilizer) system offers effective correction of approximately 4 stops, enabling easy handheld photography. HSM (Hyper Sonic Motor) ensures quiet, high-speed auto focus and the inner focus system eliminates front lens rotation, making the lens particularly suitable for using the supplied petal-type lens hood and circular polarizing filters. The rounded 7 blade diaphragm creates an attractive blur to the out of focus areas of images. * Sony and Pentax mounts do not incorporate Optical Stabilization. * FLD glass is the highest level low dispersion glass available with extremely high light transmission. The optical glass has a performance equal to fluorite glass which has a low refractive index and low dispersion compared to current optical glass. It also benefits from high anomalous dispersion. These characteristics give excellent correction for residual chromatic aberration (secondary spectrum) which cannot be corrected by ordinary optical glass and ensures high definition and high contrast images. * Vignetting will occur if the lens is used with image sensor larger than APS-C size or 35mm SLR, and APS Film SLR cameras. The Sigma 18-200mm f/3.5-6.3 II DC OS HSM doesn't have any user reviews yet!